Oh hiiiii! Sorry, I was just itching my back. My skin is so dry some days that it is really scary. Well at least it used to be. I had tried every single lotion that was marketed as “deep repair” or for “severe dry skin” and let me tell you. Not a single one worked. So I spent my days itchy and flakey and in an all around miserable mood because my skin was so itchy. 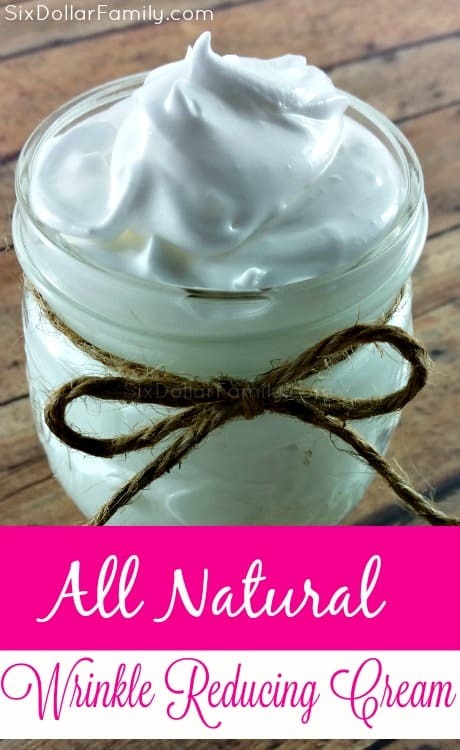 That is until I made this homemade healing lotion for dry skin. It has become my second favorite homemade beauty product falling just short of the Green Tea & Peppermint Bath soak that I make. That one is my fav just because it relaxes my muscles and Momma likes relaxed and stress free muscles! This one though may just take over as my favorite before too much longer because as the weather turns cooler? I will need it to use it more once the colder temperatures settle in and start drying my skin out. 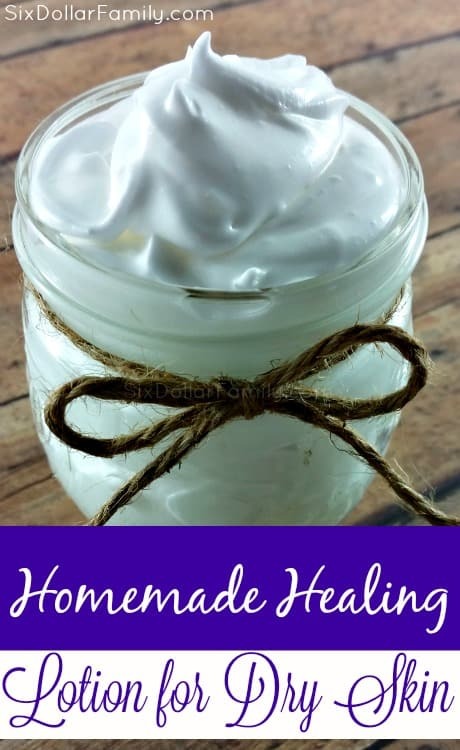 This healing lotion is fantastic because not only will it moisturize your skin, but it will also help repair damage that has already been done by dry skin and even just normal aging! Because it has Vitamin E in it, it also gives it a dual use as a wrinkle reducing cream! Whoo hoo for dual use products and not having to spend extra money on multiple ones! This, like our other natural product recipes here on the blog, is super easy to make. It whips up in just a few minutes and can keep in the fridge for up to 6 months. Vitamin E helps to work as a preservative so that will help it keep longer than most homemade beauty products. That makes it the perfect DIY gift idea too and this goes very well in gift baskets! The peppermint oil in this recipe will cause a cooling sensation on your skin. If that irritates you or you don’t want it, just skip the peppermint and go with the Lavender oil only. Melt the coconut oil in a double boiler or over low heat. Once it’s about half way melted, add the vitamin E oil and stir to combine until the oil is fully melted and clear. Once the oil is melted, pour it into a metal mixing bowl and stash the bowl, your mixer beaters and all in the freezer for fifteen to twenty minutes. Pull the bowl out of the freezer and beat on high for 3 minutes. At this point your coconut oil will be a cloudy color. Scrape the sides of the bowl down then add the essential oils. Continue mixing until it is well combined and fully whipped! 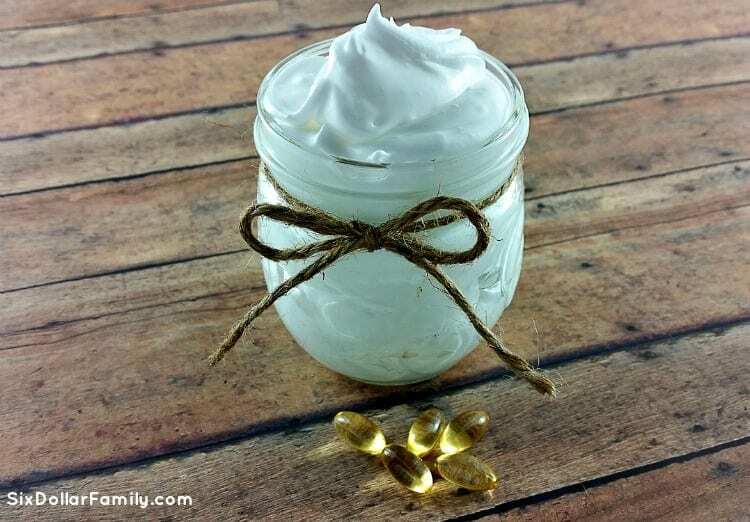 Looking for more natural products you can make at home? Check out these natural home and beauty products! Work in place of a metal bowl? Glass will work however, it will fluff better in a cold metal bowl. I am allergic to perfumes and fragrances . . . I am not allergic to Lavender, but I have a severe reaction, no matter how many people tell me their oil is different, they don’t add fragrance to their oil. (My nose, eyes, and lungs tell a different story.) Can Lavender be substituted with another essential oil? Bear, any oil that has healing properties should work. Lavender, tea tree, lemon, peppermint, etc. Wow – this sounds like a wonderful recipe. Keeping it cool for us desert dwellers sounds like the perfect thing! Hi, what is the shelf life? Will it work on eczema? Allyson, I haven’t tried it on eczema but I can’t see why it would hurt to try. There’s nothing in it that would do any harm. I’m very excited about this article. I am new to this whole non-toxic homemade products thing so any education that I can get is very helpful. I have been dealing with a neurological condition for the past year and a half and my doctors want me to discontinue as many chemicals in my food, skincare, and home as possible. Is this safe to use on your face??? I didn’t know if the peppermint oil would be too harsh. Cheryl, you can use any oil that you want. Peppermint might be too strong for your face so if you plan to use it there try something more gentle like Lavender oil. Sure hope you meant you were scratching your back and not itching it. I cannot imagine why you would want to itch your back if it was already itchy. The Vitamin E oil is a softener and skin moisturizer. I wouldn’t skip it to be honest. Just came across this recipe a few days ago and am eager to try it. I know that coconut oil stains clothes, so how long do you let the lotion set before putting clothes on? I haven’t had any issues with it staining my clothes. I only use a small bit each time so it dries prettty quickly. Where do you get the ingredients? Can you find them at Walmart, or do you buy them online? Sarah, if you click the links in the post, it will take you right to each product that we use. Doesn’t it make you smell like coconut all the time? LOL no, but if that was a concern, you could add a few drops of essential oil for fragrance if you wanted.